Daniel Cutter asked whether I'd tried the “Camo Duck” shot on my previous post in black and white. 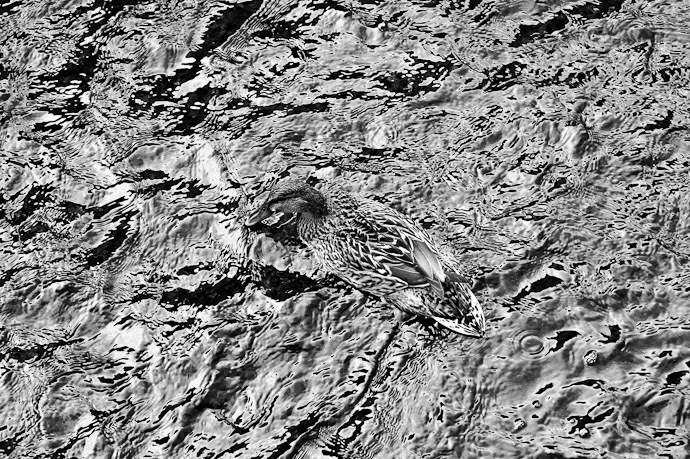 The nature of the original shot had it almost all monochrome to begin with, except for the duck itself, but prior to Daniel's comment I hadn't thought to take it all the way to pure monochrome. But, it's easy enough with Lightroom (as simple as the “v” keyboard shortcut). Wow. 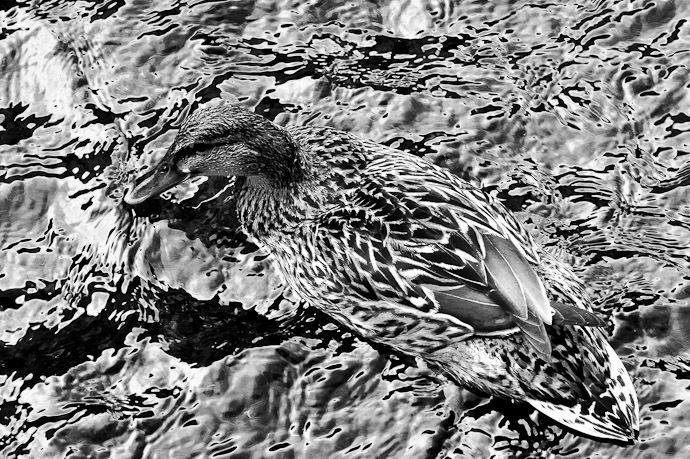 I then tweaked the B & W conversion a bit to melt the duck away a bit further, and here we are. I'm not sure whether it's photography, but it's fun. Thanks for the idea, Daniel. It's all the more fun in this case because I took the original shot in passing (literally, while walking) just because the duck happened to be there as I was going by. I knew instinctively that I'd probably just delete it as soon as I got home, but upon inspection, the patterns in the water and the uncharacteristically sharp focus on the feathers saved it from the bit bucket. Very cool. That *is* a *sharp* lens. Natures version of “Dazzle” camouflage! Thanks for the interesting link, Bill. I learned something today. Now this is definitely cool!! This is something that i’d love to do with some of the people in wedding parties that I have to deal with. Camouflage them so they don’t show up in the picture!! Love these! !